Check out our latest advanced tutorial on creating crosslinked polymers with the ReaxFF bond boost method. By judicially adding a bias potential when the epoxy resin and amine hardener are in a geometry prone to reacting, this method accelerates the reactants across the barriers, enabling crosslinking reactions within reasonable times while keeping close to the actual reactive molecular dynamics. 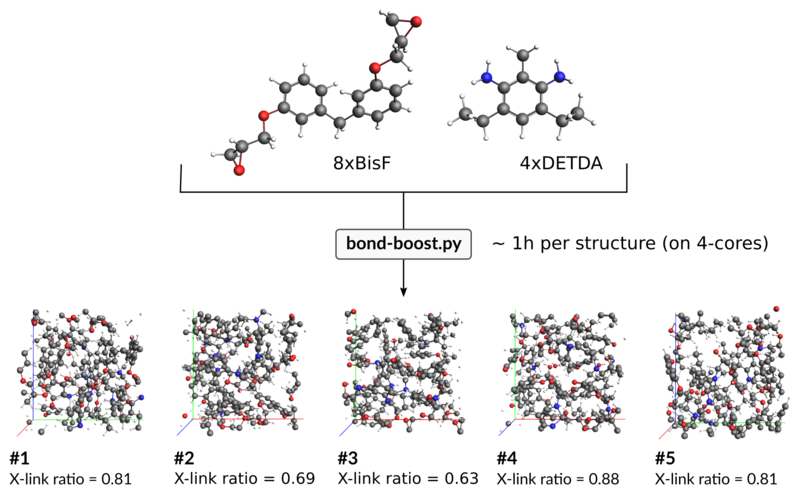 The hardened, crosslinked epoxy polymers obtained with the ReaxFF bond boost are realistic structure, reaching high crosslinking densities in correspondence with experimental results. The generated crosslinked polymers can subsequently be used to study their mechanical properties. The bond boost uses a reaction template to add a bias potential in cases where certain geometry constraints are met (e.g. when all C-N, N-H, C-O, and H-O distances are within a certain range). The method can be extended to other chemical reactions by defining suitable reaction templates and biasing templates. We’re always happy to discuss how your research can benefit from new developments such as the ReaxFF bond boost. Let us know if you want to discuss! Would you like to keep up to date with the latest developments in the ADF Modeling Suite and the SCM team, learn more about new applications and functionality? Subscribe to our newsletter!